Cruising along the Grand Canal from the airport to our hotel in San Marco, my companion points out the beautifully restored neo-classical façade of the Palazzo Grassi. A vast silver-grey sign with white lettering heralds the exhibition of Rudolf Stingel, an artist I confess to have never heard of. I politely nod in acknowledgement, but in all honesty, at this point I am only concerned with the prospect of navigating through the sprawling sites of the 55th Venice Biennale – The Encyclopaedic Palace. ‘Who is Rudolf Stingel?’ I ask and I am then reminded of the BBC’s The Culture Show. 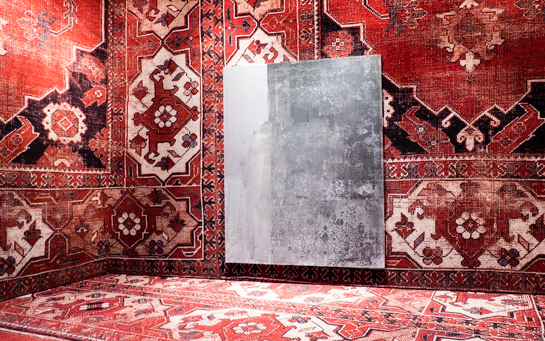 I watched the Venice Special in September, entitled A Tale of Two Cities, which featured two art experts, Alastair Sooke and Dr Bendor Grosvenor, jovially discussing picking remnants of carpet out of a skip at the end of Stingel’s exhibition. It was a brief moment in their program and one that left me with no intention of spending my first trip to this majestic city looking at rug covered interiors. However, I am duly persuaded to agree to the possibility of a quick view… if there is time on the third day. Three overcast but beautiful days later after marching through the Arsenale and wandering about pavilions of the Giardini, we attempt to visit Richard Mosse’s The Enclave at The Irish Pavilion, Fondaco Marcello. Inexplicably the venue is closed; there is only a carrier bag of rubbish hanging from the gallery door and a few puzzled rain-soaked pilgrims trying to find an alternative way in. My companion, unperturbed by this minor irritation, takes my arm and leads the way through the medieval labyrinth. Before long we are standing at the side of the Palazzo Grassi. On entering the atrium the predominantly red Ottoman-style carpet dazzles, sprawling across the floor and up the grand ascending staircase, not unlike the foyer of a five star hotel. Uncharacteristically, I cannot resist the urge to bend down to feel the pile beneath my feet, rather more bristly than imagined, but luxurious underfoot nevertheless. The black and cream motif repeats across the floor and appears to be at scale, but its digital quality creates a vibrancy; an immediate feeling of anticipation that is quite arresting and an intense urge to see what is at the top of the staircase. If I was ever glad to have taken the stairs rather than the lift, it is now. What can only be described as a wow moment happens on arrival at the first floor; at this point I come to realise this is the most incredible installation I have ever seen. From the balcony it is possible to look across at all four sides of the building, to look down into the atrium and to look up to the second floor. It is here that it becomes apparent that the carpet almost acts as a connector between the architectural spaces, the history of the hosting city and the works created in modernity. It is important to realise that the carpet is contemporary, based on an Ottoman rug, digitally reproduced and printed onto modern fabrics. It is symbolic of Venice’s past as a rich trading city and it serves as a reference to a religion other than the Catholicism so steeped within the bricks of the city. It can also be read as a reference to Sigmund Freud’s study in Vienna that was covered in an array of Oriental rugs, even on his therapy couch. The carpet is now covering floor and walls; the motifs have changed scale, up to eight times larger, and it becomes a backdrop for the most amazing silver grey abstract paintings. Each painting has a room or chamber, at times a salon, devoted to it. These large-scale canvasses vary in size. Their surfaces are textured leaving traces of the hand that has worked them. The silver-grey paint is reflective but not mirror-like, darkened in areas, with some paintings embellished with motifs. One smaller canvas has a repeated motif overlaid, akin to a William Morris wallpaper; the visual effect is beautiful. Another is a brighter silver; there is a white fence-like grid across the whole surface. At the bottom right-hand corner of the painting there is an area of repetition of the grid, a small area that creates a ripple of movement. On the balcony, overlooking the atrium is a massive triptych. Three imposing canvasses locked together like a shimmering wall of mist. Again, the surface shows the delft application of paint and we can witness the mastery of Stingel’s hand. It is on the second floor that the threads come together. Walking through this level we can see a dramatic shift in style. These monochromatic paintings are much smaller in size showing a different side to Stingel’s practise. They are described as “portraits of sculptures” based on photographs of saints of the Catholic Church. Some are serene; others are rather macabre and eerie. Some are shown alone; others hang together in small groups. One such group are overlaid with motifs, rather like a veil of lace conjuring images of the Mantilla worn by women in traditionalist or orthodox services. Among these works I become aware of the incredible hush – the silence that haunts the entire Palazzo. There are other visitors walking around but we are all unaware of each other. It is as though we have all succumb to a contemplative state. The photo-realistic paintings of Christian saints and Madonna’s force us to re-examine reverence. In this silent, cosseted environment, alone, faced with images of faith – are we reverent of art or are we reverent of the saint? Are we reverent of art in the same way we may be of our faith? Or are we reverent at all? The Ottoman inspired carpeting, which has religious connotations in the Muslim faith, providing a backdrop for such highly Catholic images causes a thought provoking contrast. Yet, instead of battle we have harmony. A harmony that is visual and sensory, strangely peaceful. This is the first time Palazzo Grassi has invited an artist to install a one-man show. The way Stingel has approached his invitation has dramatic parallels with the Tintorettos of San Rocco; over 5000 square metres are completely enveloped by one artist’s vision, controlling its visitors through his own depiction. The sheer magnitude of this work is astounding, the show has great tension that totally captivates its audience through its many contrasts: coloured carpet and monochromatic paintings; Christianity and Islam; historical Venice and the city today that plays host to the most prestigious display of contemporary art. The entire work of this incredible installation seems to be autographed by Stingel’s huge photo-realistic self-portrait in the atrium. Complete with coffee stained mug rings, which suggests it has been based on an old photograph that has been lying around for some time, the painting echoes the same treatment of the enormous portrait of his friend Franz West that hangs alone in the enormous salon on the first floor. Here in a moment of self-reflection, Stingel looks away from the viewer; his gaze seems to be questioning. Much has been said in other reviews of the effect of the exhibition being that we are put into the mind of the artist. I would argue that the artist is actually activating our own psyches, asking us to question what his works mean to us. As curator of his own show, Stingel has complete control of presentation and effect. The insulated interior makes a place of complete meditation, of dream-like quality, and here we come back to the Ottoman carpet; have we as viewers been placed on Freud’s rug-covered couch?